The Improving Combination Play drill will help improve combination play as well as switching the point of attack. 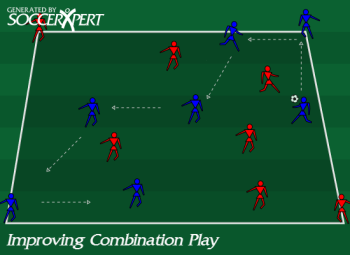 Use this soccer drill when you are organizing a soccer practice around passing and moving. Create a grid approximately 40X40 yards. The area of the grid can be increased or decreased depending on the number of players and/or the skill level of the players. Split your team into 2 even groups with no more than 8 players per group. Make sure the teams are easily distinguished with colored bibs. Have the RED team place a player in one corner of the grid and another player in the diagonally opposite corner of the grid. Have the BLUE team do the same thing on the 2 open corners of the grid. The players in the middle will play keep away from the opposing team while trying to score points. Award a point each time a team passes the ball into their team’s corner player, who then must play a first time ball to a third player on the same team. The player that plays the ball into the corner player then becomes the new corner player. Make sure players inside the grid play early balls to quickly change the point of attack. Players must play together and be thinking ahead to effectively support the attack. Corner players can move around the corner to adjust their angles and positioning. If players are still struggling with 1-touch passes, increase the number of touches from the corner players to 2-touch. Limit the inside players touches to encourage more passing.